TIRE SWING TRAVELS: I WAS TOLD THERE WOULD BE NO SNOW!!!! I WAS TOLD THERE WOULD BE NO SNOW!!!! Saturday John went down to the Vulture Mine near Wickenburg for a photography workshop. Sunday the workshop continued here in Prescott. You can read about it here. It was a really great workshop and Rich is a good instructor. Rich has been undergoing some medical problems, but like any good instructor didn't let it get in the way. His posts on Sat. and Sun. will give you a little taste of what we worked on. 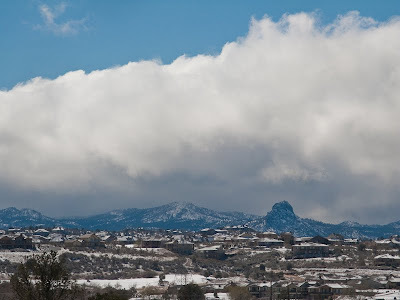 We have been in Prescott for a week and have really enjoyed it. Except.... it's too cold. Even though we are only 70 miles north of Phoenix, we are also 2000 feet higher and the temps are between 20 and 30 degrees cooler. 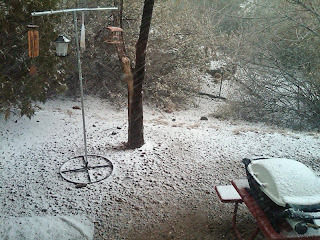 Which also means when it rains in Phoenix it snows here. 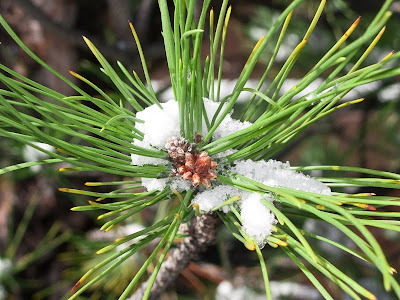 This morning we awoke to more snow and blowing wind. It's the kind of day you just want to spend inside. You know, the kind of days we are used to back in Michigan. We were planning on driving north to Jerome and also going on a scenic train ride, but it's just too darn cold. So we are heading back south in the morning. We are going to go back to Lake Pleasant Regional Park near Phoenix for a few days before heading west. 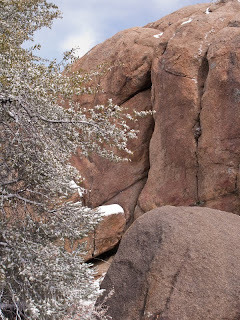 We will probably stop in route at Quartzsite for a day and then spend several days in the Borego Springs area. 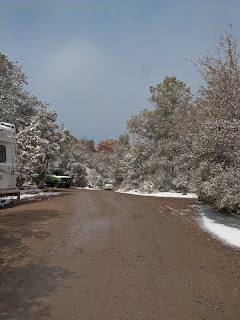 We really like Prescott and the people here, and can't wait to come back....when it warms up!! The last couple of weeks have been stressful for us. 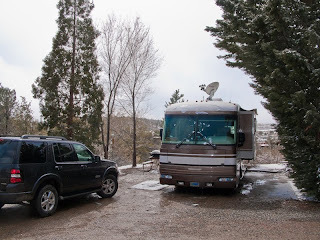 We love this RVing life style but you sometimes feel disconnected from friends and family. Two weeks ago we got a call from some close friends back in Michigan. The wife had undergone surgery for cancer last year. Well, it looked like it was back and more surgery was necessary. Then last week our son called with news that his expectant wife was in the hospital with serious complications related to her pregnancy. Once again we have been reminded, that life is so fragile and so precious. Good health is a gift and something we need to be thankful for every day. The good news is that after our friend had surgery, it appears that it wasn't cancer after all, and our daughter in law may be home from the hospital this weekend, although they are going to induce labor a month early. We want to be there to welcome our 5th grandchild into this world so we will be back in Michigan towards the end of April.